In order to create business value from purpose it is essential to be congruent in communication and sustainable behavior so 'Be good and tell it' is a common saying when it comes to corporate sustainability. 'Be good' cannot go without 'tell it' and vice versa. Congruency in communication and behavior is therefore essential. If behavior and communication are not in harmony with each other, the green washing ogre emerges. On the other hand companies with authentic sustainable behavior that barely communicate about their sustainable performance miss out on vital reputational opportunities. Recently Reputation Institute published a Dutch based briefing on the gap between “perceived and actual” sustainability mapping its own RepTrak data with that of Corporate Knights. 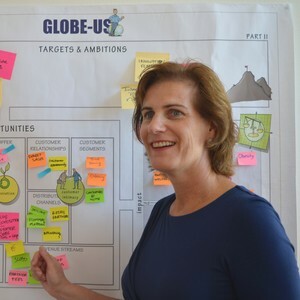 The bigger picture of the Dutch based sample is that a company’s reputation is directly influenced by over 40% through the three out of seven reputation drivers: Governance, Workplace and Citizenship. Finch & Beak has been applying this approach since 2013 in a variety of sectors. As the availability of detailed DJSI data from Bloomberg on entire sectors has exponentially grown since in the last year, a huge opportunity has materialized to efficiently combine, compare and zoom-in on the facts and perceptions of corporate reputation in the light of sustainability efforts. Strong sustainability performers already go beyond the status quo and leverage the communication opportunities by showcasing the content in order to strengthen the corporate reputation and build trust amongst all stakeholder groups. But making this work is not as simple as it seems which is illustrated by Belgian telecom company Telenet, industry group leader in the DJSI in the last 5 years. Within three years, Telenet’s total DJSI-score grew 58%, while their RepTrak score increased with just 14%. These overall results were an indication that Telenet’s strong sustainability profile was underleveraged and that there had to be opportunities for reputational improvement. A further detailed big data analysis revealed the right areas to focus on and to get Telenet to the CSR reputation it deserved. Is your sustainability performance underleveraged? 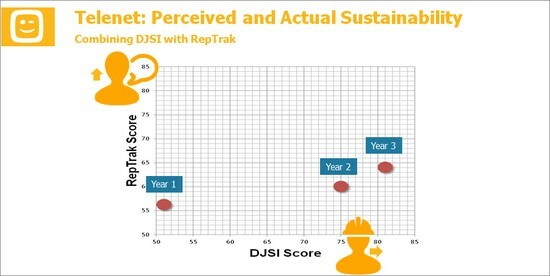 Why not make the most of your DJSI efforts by capturing more value from your sustainability and reputation data? The upcoming summertime provides an excellent moment to combine, compare and zoom-in and make your sustainability communication efforts more effective. In case you are interested in our approach, feel free to mail Josée van der Hoek, senior consultant, at josee@finchandbeak.com and ask her about our reference cases, djsi services and service description.